Whisky with warming ginger and orange, great for Christmas parties. The combination of Johnnie Walker Red Label Whisky with fiery ginger beer makes a perfect long cocktail for Christmas drinks parties. Or try it paired with an aromatic orange liqueur for a delicious after-dinner digestif. 1. 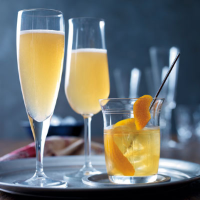 Pour the whisky into a champagne flute and add a dash of Angostura Bitters. 2. Top up with ginger beer and serve swiftly. 1. Place the ice in a small tumbler and pour over the whisky and orange liqueur. 2. Muddle together, add a twist of orange peel and serve. Try adding 2 tbsp sweet vermouth in place of the Angostura Bitters.